Summary: Kill the beast. Win the girl. My Thoughts: Oh MY WOW!!! I seriously loved this one! Oh my gosh! I didn’t know if I would even enjoy it as I started it. I wasn’t really thinking I was going to. But, dang was I sucked in quickly and I couldn’t stop reading! I needed to know what happened! I took a few breaks and while I was taking those breaks, I wanted to get back to reading. We are introduced to Princess Aerity. She was so spunky and nice. She was generally a good person! I loved her personality. Well, Aerity has a big decision to make. She has always wanted to marry for love. She wants a husband who gets her. 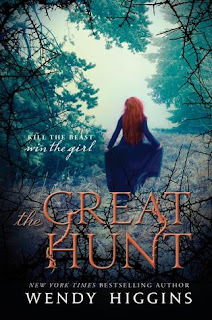 But, when a wild beast starts attacking her land, her father offers all people to come hunt the beast and the winner will become Aerity’s husband! This brings a lot of men to her kingdom. And even a few women. People know this could change their lives for the better. It also brings two brothers along. Paxton and his younger brother. Dang, I knew I was going to like Paxton from page one. I just loved him! I also liked how it went between Paxton and Aerity and gave us a glimpse into each of their lives and minds. Well, the beast is a mighty creature and it’s hard to kill. Everyone goes after it. I also loved finding out all the secrets. Paxon had quite the secret but I saw it coming but still enjoyed it. I want to brag about this book and tell you all the details but I don’t want to say much. I really did enjoy it. Probably one of my favorites this year so far! I loved the romance, the mystery, and just all the little details. I loved even the side characters. I won’t say much else because I want you to experience it yourself! I’ll leave you with this… I LOVED IT! Overall: I loved The Great Hunt!!! What a great story and I flew right threw it! I have read Higgin’s book Sweet Evil, but I liked this one more and I think I’ll enjoy this series more! I just loved Paxton and Aerity both! Cover: Love it! It fits perfectly! Pretty too! OOoh nice! Looking forward to reading this one too! I love a good fairy tale retelling and I am hearing lots of good things about this one! Very nice review!